On March 2, 2012 courageous men and women from the communities of San José del Golfo and San Pedro Ayumpuc joined together in opposition to the construction of a gold mine near their homes. Their concern is that the US-owned mining operation will negatively impact the air and water, damage crops and affect the health of their families and neighbors. Now, as the movement approaches its second anniversary on March 2, 2014, we want to honor its members for their commitment to non-violent resistance, as well as for their success in defending human rights and the environment. 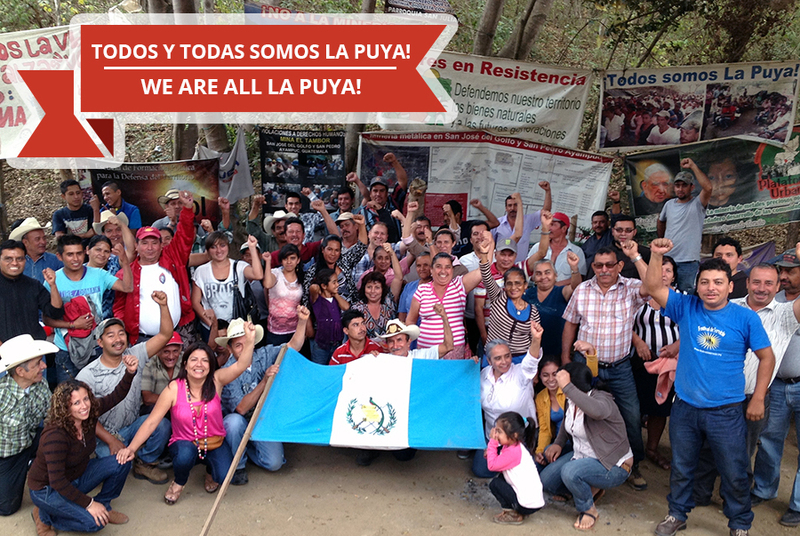 La Puya: Celebrating Two Years of Peaceful Resistance from Guatemala Human Rights on Vimeo. Community members were shocked when they first learned about the prospective gold mine — then owned by Canadian company Radius Gold and later sold to US Engineering firm Kappes, Cassiday & Associates (KCA) — in a local news article. Many were outraged that they had not been consulted about the project, which they feared could affect the health of their families. Although they contacted various government agencies, residents were either ignored or deliberately misinformed about the status of the mining project. On March 1, 2012, one valiant woman decided that she had had enough. She parked her car near the entrance to the mine, preventing trucks and mining equipment from entering the site. On March 2, 2012, other community members joined her protest, transforming the roadblock into a peaceful, community-based resistance movement that became known as “La Puya.” Working in shifts, residents took turns in order to maintain a human blockade 24 hours a day, 7 days a week. In their struggle to defend the environment and human rights, members have embraced one guiding principle above all others: a wholehearted commitment to nonviolence. This commitment has been repeatedly put to the test. When pro-mining agitators — controlled by two former military officials — hurled insults at them, the members of the resistance responded by passionately intoning the national anthem. When hundreds of riot police arrived to violently evict them, the women of the resistance lay down on the ground and sang religious hymns. When gunmen tried to murder community leader Yolanda Oquelí, she and the others strengthened their commitment to the struggle. Not only have those crimes remained unpunished, but members of the Puya themselves have had false charges brought against them in an attempt to break their spirit and weaken the resistance. Community leaders attended a hearing in Guatemala City on February 14 to face charges of threats, kidnapping, and coercion. The judge declared that the prosecuting attorney had arrived without the proper credentials and suspended the hearing until April 2, 2014. To each insult, threat, and physical attack, La Puya has responded with music, prayer, and mutual solidarity. As one community leader affirmed: “if any blood is spilled here, it will be ours. That is how deeply we believe in nonviolence.” Now, more than ever, community members at La Puya need us to stand alongside them in solidarity.